I am fated forever to drive the same car that is routinely driven by little old men in felt hats and exasperated middle-aged housewives with too many kids squirming vigorously and uncontrollably about the front and rear seats. There's no question about it: automobile dealers must have a policy to routinely dispense big discounts for these vehicles to every little old guy and harassed housewife immediately upon their entrance into dealer showroom or used car lot. And upon my entrance too. But it isn't just folks like these and me who drive this car. Everyone drives it! You probably drive one too! 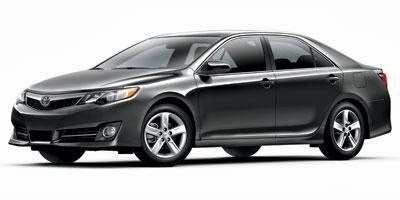 But despite its plain vanilla reputation, I love my late model dark gray Toyota Camry. It's a lot of car for the money, has a cool bluetooth feature that makes your cell-phone hands-free, and doesn't even look all that bland and insipid. Notice I said all that bland and insipid! Because everyone in America under a certain income level owns a late model dark gray Toyota Camry, it is impossible to find yours in a parking lot unless you are one of that rare breed of persons who actually pays attention to where you left it. In any given lot on any given day at any given hour, you could play connect-a-dots with all the late model dark gray Toyota Camrys and come up with a fascinating abstract shape, if not actually a shape that exists in the tangible world. "I'm hitting my remote, why isn't the door opening? Oh, that's not my car; that's right, I don't keep Nazi memorabilia in the back seat." "Sorry to crash my shopping cart into yours, miss! I thought I had opened my trunk just when you were opening yours..."
"Geez, I'm sorry, sir! Thought this was my late model dark gray Toyota Camry. I didn't mean to get in your car and sit on your lap." "Yes, Yes, Oh, Yes .... Oh, Oh ... you're the best!.... More! .... More! .... WHO THE HELL IS THAT?!!!" "Gee, I'm sorry, you two. Name's Perry. I thought this was my car." "That's okay, buddy. Happens to me all the time too. Now, if you don't mind?" It isn't true of course, but now nobody --- including little old men in felt hats and harassed housewives --- is ever going to mistake my late model dark gray Toyota Camry for their own.